I did it! 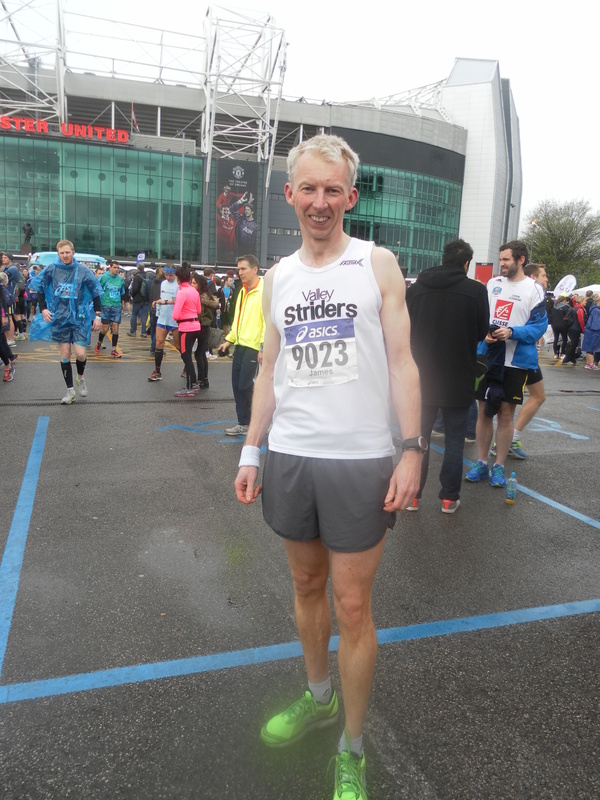 I finally bagged a sub three hour marathon time – with a chip time of 2 hours, 56 minutes 32 seconds at Manchester on April 6th. All went pretty much according to plan and I had a really enjoyable day out. My overall feeling is one of great satisfaction in putting together a clear plan, doing the training and then finally executing my target race pretty well. The day didn’t start out in the best way. The plan was to travel across with two of my Valley Strider team-mates, Andy and Hannah. Unfortunately, their little boy suffered illness late on Saturday which meant that Hannah could not make the race. That was a shame, I’m sure she would have really enjoyed it and run a good time on a flat fast course. Andy travelled across with me and my support crew (my sister). We parked in a non-official car park about half a mile from the start and had a stress free trip to the race village. I shook Andy’s hand and wished him well and then made my way to my designated start pen (thankfully, the ‘A’ pen, near the front). 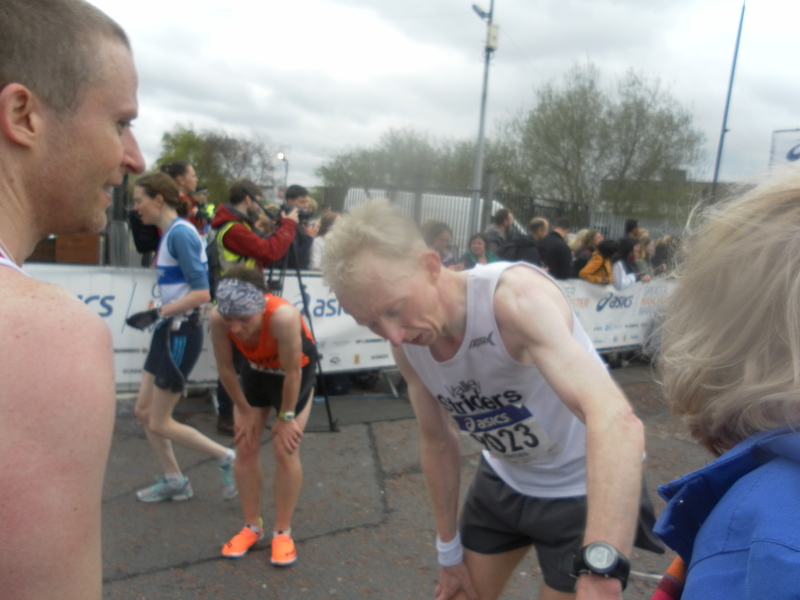 As I snuck over the barriers into the pen I was fortunate enough to bump into fellow Strider Rav and then I found myself standing right next to Tom Williams and Martin Yelling – co-hosts of the celebrated Marathon Talk podcast. Martin is the husband of Olympic marathon runner Liz Yelling. Tom and I had the epic race over 10 miles at Thirsk two weeks ago and Tom asked if I was going to run with them – they intended to run at around 2:55 pace. I readily agreed, knowing that Tom and Martin would pace it pretty evenly. 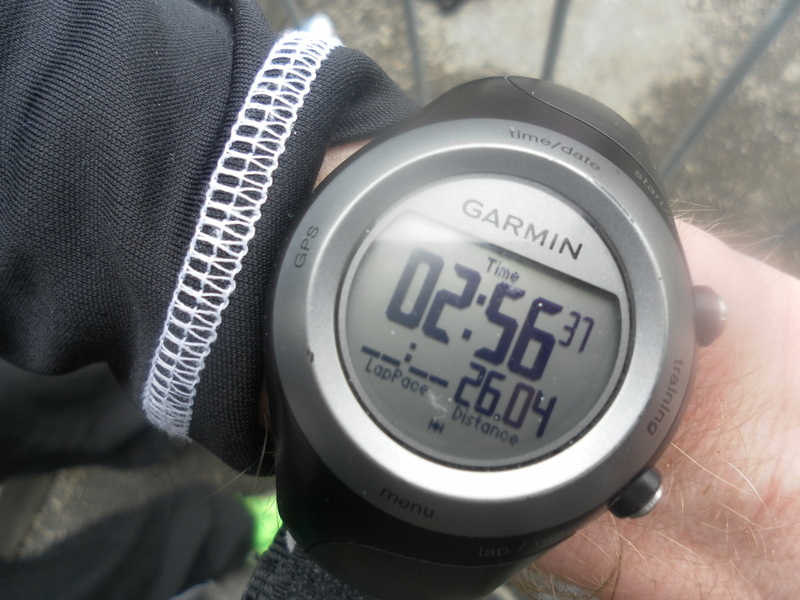 My only slight doubt was that 2:55 was right at the top end of my target. The first few miles went by fairly smoothly except for one nasty incident after about 3 miles. Just as we were stuck behind the gaggle following the 3 hour pacer, Tom said that we should try to get around them. At this point we were running on a road that was divided in the middle with cones – the big ones that you see used for motorway road works. As I went to the middle of the road to try to get around the pacing group I ran straight into a thigh-high traffic cone. I could easily have been knocked over and injured, but after a bit of a not very graceful stagger I managed to regain my balance and composure, embarrassment was the only issue. We made 10K in 41:42 – by now there was a Marathon Talk group of around 9 or 10 forming the bus, steadily knocking off 6:45 miles. It felt great, really comfortable and we were able to chat away as we made our way through Sale town centre. Running with Martin and Tom was like running with Rockstars – they have a huge listenership and loads of people recognised them and were shouting out as they passed, especially in the out and back sections where you pass slower runners going the other way. As we ran from Sale Moor towards Timperley, Tom announced that he needed to have a leak and he darted off down a side alley. Martin and I decided that it would also be a good time for a tactical pee and we found a likely hedge a few yards further on. After the pit stop, Tom was about 30 metres in front of us. Martin said that we would reel him in gently over the next mile. However, Tom seemed to be speeding up! Instead of 6.45 miling, we were now running much quicker – sub 6.20 miling. The faster we went, the more he seemed to accelerate. It dawned on us that Tom thought that we were in front of him and he was speeding up to try to catch us! Thankfully, after a couple of miles of this, Tom realised, though by now he was a good 60 metres in front of us. We finally caught Tom in Altrincham, just before the halfway point, which was passed in 1:27:05. That was about a minute quicker than I had planned for, but I still felt pretty good. I got the first pangs of concern at 17 miles when I felt the pace was starting to test me – not hugely, but rather than feeling easy, I was working. I lost a few metres as I fumbled to get a gel from my shorts pocket and suddenly I was slightly adrift a few metres off the back of the group. I remained calm and assessed whether I should drop off, or work to get back on. I decided to zip it up and so I gradually re-joined the group as we ran through Sale towards the Carrington bypass. Tom was squeezing the pedal harder at the front and for the first time Martin dropped off the group by a few metres. Just before Carrington, I finally accepted that Tom was too strong for me and I had to concede and let him go. To his credit he shouted back to ask if I was OK, I said fine, but I was dropping off. I had done 20 miles of the job and I didn’t want to ruin it by detonating in the last 5 miles. Martin got back on my shoulder and we ran the next few miles together, turning for home through Flixton. However, we were slowing. For the first time, we did a 7+ minute mile split at 22 miles. It started feeling extremely tough. The legs were heavy and I was working hard to keep the mile pace between 7:00 and 07:15. Martin dropped me and for the first time I was falling back through the field as a few runners shuffled past me. It was just a case of digging in as hard as I could. By this point, your pace is whatever you can muster. You can’t really speed up much even if you want to; it’s more a matter of trying not to slow down. The course turned left at Stretford with one and a half miles left to the finish at the Old Trafford football ground, an imposing sight up in the distance. By now I knew that the sub three was in the bag – as long as I kept running, I would have it easily. I looked up and realised that I was rapidly catching Martin. He had really slowed and looked pretty shot as I passed him with about a mile to go. I uttered some words of encouragement and implored myself on – looking up and giving myself small targets in my head like “run hard to those traffic lights”, “don’t look at the watch until you pass that furniture shop”. Mission Accomplished – Oh baby! My official result was 2:56:32 for 144th place out of 5903 finishers. I was 13th in the MV45 age category. Tom had run a fantastic 2:53 with a 1:27 / 1:26 negative split – a brilliantly executed run. Well done Tom! Martin came in about a minute behind me he had done really well as a hamstring injury had severely restricted his preparation. You have to do the miles! Lots of them. There are no shortcuts, no 30/40 mile a week plans. I think a minimum of 50 miles every week for 14 weeks with a minimum of 5 runs of 20 miles or longer is required. I tried to run every day, accepting that occasionally work or life got in the way. Work on your basic speed – having a faster 5K time means that running more quickly in longer races feels easier. Speed is always an asset. Weekly parkruns are a fantastic way to improve your basic speed. It may take you a few attempts – Learn from each experience and adapt your approach accordingly. You have to respect the distance – it’s a very, very long way. A marathon is nothing like a 10 mile race, a half marathon or even a 20 mile race. So many people say “I ran great until 20 miles then the wheels fell off”. When I hear this, I think “I ran the first part too fast, then I was knackered” It’s a 26.2 mile event, not 20! You need to still feel pretty good at 20 miles. Eating well and losing weight helps greatly. I ate a mainly low carb, fat and protein based diet and lost about 6 pounds during my training. I felt great and didn’t suffer any cravings and rarely felt hungry despite my increased training load. You must commit to your training. Tell your friends about your target, write a blog, do whatever it takes to help you get out of the door on that dark cold morning when you would rather stay in bed. Try to run with a group of people with similar goals. I’ve really enjoyed getting to know my team-mates better and engaging with their training ambitions. Running with others especially helps on the long runs. Use a few races during the build up to gauge your progress. A 20 mile race about a month before the marathon is a great test, aim to run it at target marathon pace. Good pacing in the race is essential. Forget any thought of banking time and hanging on. It is doomed to end badly. Plan for an even split, or even a negative split – a thing of rare beauty in marathon running if you can manage it. You don’t need to carry 17 gels and three bottles of water with you in a marathon. I took only 2 gels in my race and regretted having the second one. Only worry about hydration if it is hot. If it’s a pleasant 10 or 12 degrees just drink to thirst. Thanks for reading, good luck with your running! Thanks for the link Tom – Never had so many hits on my blog! its gone mad! Thanks again for a superb day on Sunday. I’ll never forget it. Great blog and chuffed for you. Been there and got the TShirt. Top tips regarding the sub 3. Great blog…. I’m chuffed for you. Your tips for the sub 3 are spot on! Been there and got the TShirt. Fantastic (Tony Smith here in Perth linked this to FB). I am doing my first marathon (aged 46) in 13 weeks and am six weeks into the program (doing 100km a week with all the fruit you mentioned). Looking at 3:07 and your blog post – and advice – is an encouragement that I am going about it the right way. 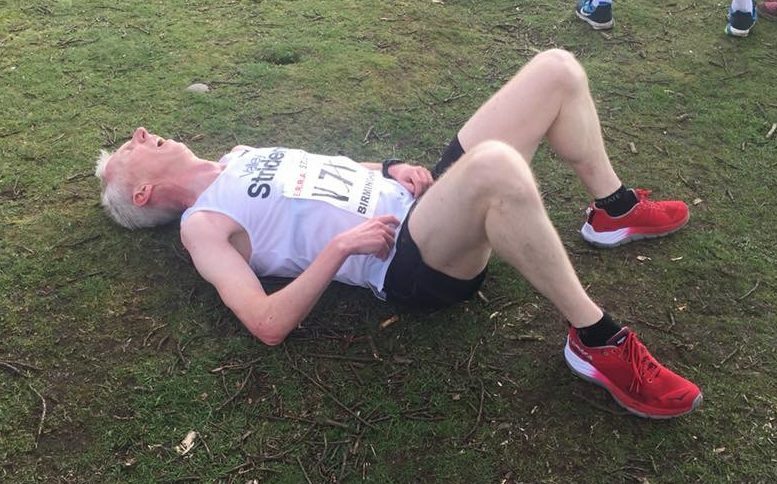 Stephen – Thanks for reading a good luck with your marathon – stick at it! Great effort James – many congratulations to you. Your blog really resonates with me. I ran my first marathon in 1993 and have done 15 or so since (I lost count), always targeting what has become an elusive lifetime goal of a sub-3marathon. Well, just like you, in Manchester on Sunday my dreams came true. 21 years after I first tried it, I broke the line in a chip time of 2:57:59. Your comments make good sense – my biggest improvements this year have come from getting a wider mix of runs in – speed work as well as just doing the bloody miles. My only comment for other people would be to get it right first time, rather than taking as long over it as I have! Mark, 21 years! Well done on finally bagging it and yes, the best advice is to do it the first time, I wish I had back in 1997. Well done James. Some great advice. The closest I’ve even managed is 3:18:05 in Boston last year. I ran 7min/mile up to mile 19 and then the wheels came off big time in the Newton Hills and I thought I was on for 3:05. You’re spot on about even pacing but it’s something that has always eluded me. A cracking read and nuggets of advice. Congratulations on you achievement. So pleased for you that you nailed a sub 3!! Shows that dedication and perseverance pays off. Well done, that’s a fantastic and inspiring achievement! Glenn, Thanks for the kind comments. I wish you all the best for Sunday, I’ll be checking the results so go well! Fantastic race, great post, and excellent advice! Congrats James and I hope to join you someday on Cloud 2:50-something. Many thanks – and congratulations on taking the Golden Toad. I’m sure you’ll bag the sub 3 soon, you are mighty close. Well done James, this is a very helpful and motivating account. Getting into the sub three hour club is something many runners would love to do but where did you start? What time did you do your first marathon in? Sub three is on my bucket list but I’m not sure if I’m aiming too high for something that is never going to be possible. Stuart, Thank you for your comments. I ran 3:04 in my first marathon – that was back in 1997 when I was 30. I then got worse for many years, running mostly times between 3:10 and 3:40. I got serious about running again in 2008 with parkrun. After I ran 3:07 at Manchester in 2013 I thought the sub three might be possible if I followed a really committed training plan. The blog was a means of recording my training and hopefully being a record of a stand alone project for athletes with similar ambitions to mine. I hope it helps.